Graduate student Ally Runyon practices Feb. 18 at Higgins Stadium. She suffered an ACL injury during her junior season and took last year off to recover. 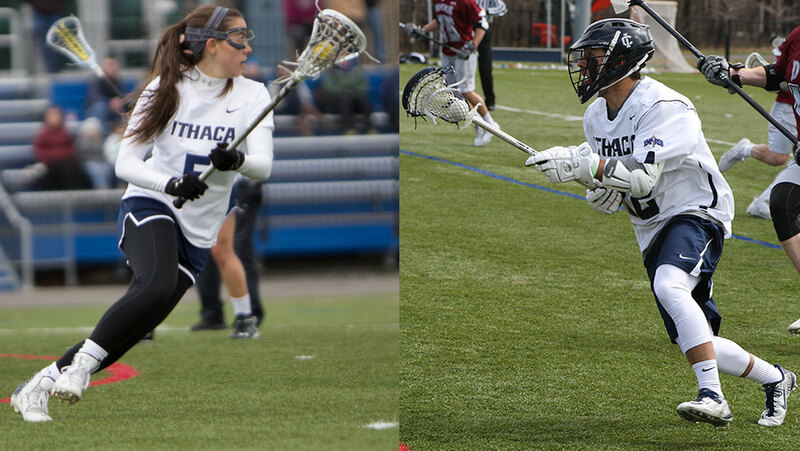 In May 2015, the Ithaca College women’s lacrosse team traveled to Nazareth College to take on St. John Fisher College in the Empire 8 Championship game. Graduate student Ally Runyon, a junior at the time, was a starter and stood ready to receive the ball from her teammate in the opening face-off. An opposing player next to Runyon received the ball, and Runyon ran back to play defense. When the opposing player switched directions, so did Runyon, but then she heard a pop in her knee. Runyon was out for the remainder of the game and for her senior season because she tore her ACL. She is now back on the team and preparing to lead the team into its upcoming season. Runyon was taken out of the game and brought over to the sidelines. She said she was not able to walk again and remained on the sidelines for the rest of the game. Runyon has been an integral part of the women’s lacrosse team since her freshman year, when she was named Empire 8 Rookie of the Year and tallied 31 goals. In 2015, during her junior season, she was named third–team All-American. With the ACL injury occurring in May 2015, Runyon could have had the surgery right away, but there was a catch. She had an anatomy lab that began at the end of May, so if she had the surgery, she would not be able to walk around the lab and would have to miss two weeks of classes. Runyon instead had the surgery in August 2015, but having the surgery later delayed her recovery. It normally takes 6–9 months for the tear to heal after surgery, and Runyon said she thought that she would come back just in time to play her senior season. However, her recovery time was set back an additional 3–4 months because of abnormal swelling in the knee, so she was unable to play her senior year. With the help of her coaches, teammates, professors and the athletic department, Runyon said, she got the support and help she needed to come back even stronger this year following the injury. Karrie Moore, women’s lacrosse head coach, said she also suffered an ACL injury in college, so she could relate to Runyon. However, Moore became the new head coach in September 2015, so she didn’t see Runyon play until the start of fall practices in 2016. Senior Morgan Racicot said Runyon acted like another coach last season and that Runyon even carried her own whistle. Moore said Runyon did a good job working out on her own to stay in shape and prepare herself for this season and came in with a positive mindset. “When you have people who miss so much, they come back with a really renewed sense of love for the game and just a joy and a gratitude that this is something that they get to do,” Moore said. Runyon said after not playing last season, she had to find her place again on the team. Runyon said she is back to playing at 100 percent, and she is determined to help the team reach its goals this season.